According to Microsoft, alpha preview of the Xbox Game Pass will be ending next week on April 28th and the service will be launching soon. 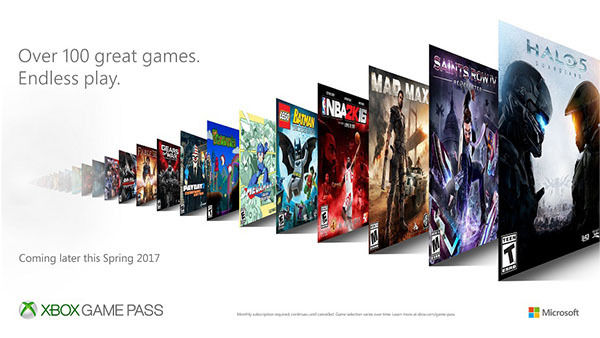 Microsoft’s new subscription service entitled as Xbox Game Pass was announced in February as a monthly service for Xbox One gamers, allowing them the access to over 100 most popular Xbox One and Xbox 360 titles for $9.99 per month. Soon after its announcement, the studio entered the testing phase of the service which is about to end next week. Thank you for participating in the Xbox Game Pass Alpha Preview. Your feedback has been invaluable and will make the service better for all gamers…We’re getting close to launch and Xbox’sGame Pass service will be available for all gamers later this Spring. The service received a lot of criticism on the internet and was referred as a competition against Netflix instead. But the service is somewhat different from Sony’s PlayStation Now as it allows the players to download the title on their console and also enjoy discounts on several titles every month so that players can update their game library. Microsoft also confirmed that the subscription service will be limited to Xbox One only and there are no chances for the service to be launched for PC. It will be interesting for the players to see new titles as they will be changed on a monthly basis. Let’s see how the service performs once it get launched. Stay tuned for more updates!